No Fenders -Formula 1, IndyCar and A Whole lot more..: The Great Nico! Having stayed up into the ‘Wee hours of the night in order to watch the Chinese GP qualifying “Live,” I was quite ecstatic over “Brittany” (Nico Rosberg) finally having scored his debutant Formula 1 Pole position... Of which I waxed on eloquently the next day’s afternoon as ‘Aunty Harriet and I sat outside in the sunshine watching Mary Ellen plant her garden... As I gleefully recanted the story I’d been told all those years ago - nearly six told - after Clyde had driven us Backhome Again Coast-to-Coast in a frightingly quick two and one-half dazes; CRIKEYS! Calling Elvis; Err ‘Aunty Harriet after finishing the race, I was most shocked to hear her story about who’d sat next to her on her flight home. At the very last moment a young whipper snapper sat down next to her, as it was the last seat on the plane. Noticing that the young German kid with long blond hair had a slightly funny sounding accent... Harriet inquired, so where are you from? What are you doing in America? After a long pause the kid said. “Ja! 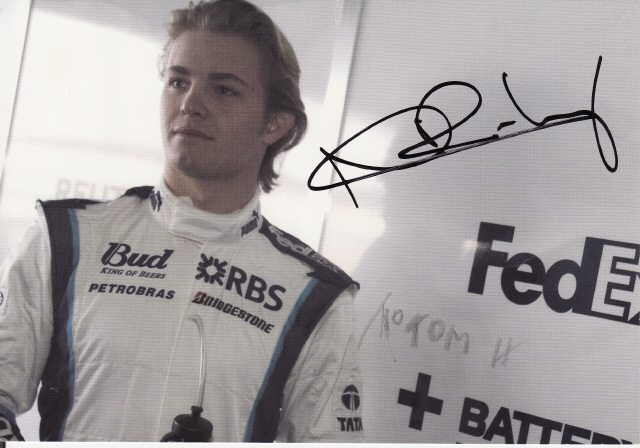 I am Nico Rosberg! I have just been at Indy to race in the USGP. Harriet had to sit next to Williams F1rookie driver Nico Rosberg on her flight from Indy to Chicago as this was the only flight poor Messer Rosberg could find in order to make his connections back home to Germany. SHEISA!!! How come I never get to have anybody famous sit next to me, eh?